When we start talking about rock and surf fishing in the inter-tidal zones at the coast we have to keep in mind there are, at least, three different ways of fishing involved here. Firstly, fishing from the beach, secondly from the rocks and finally going into the sea itself being partly submerged while fishing. Let’s call this last one “reef fishing”. Despite certain distinct differences in approach and strategy, all three ways share some common characteristics which include the need for a rod, a reel, line, hooks, sinkers and bait as well as some sort of container to carry the necessary accessories. Due to obvious constraints with regards to length when writing an article like this, I will briefly look at the basic equipment necessary for a beginner angler to participate in rock and surf fishing and I will also give a bit of advice on a few other aspects of these pursuits. I will furthermore recommend which specific equipment to purchase from both a practical as well as an economical perspective. Having been extensively involved in all three types of fishing for more than three decades I trust the advice on offer here will provide valuable insight to the novice angler. What Do I Need to Rock and Surf Fish? If you to intend to fish from rocks into deep gulleys which does not require long distance casting, rods of between 10 to 11 feet will suffice. However, casting from the beach, in most cases, will require a longer rod in order to get more distance and here you will need rods of between 12 to 14 feet. For ease of storage as well as transport, I would recommend three, or at least two, piece rods. These rods can be manufactured from fibre glass or composite materials like carbon. The spinning reel is probably the most iconic of the fishing reels and very good for beginner and seasoned anglers alike. It is a very easy reel to learn how to use and, once mastered, is very versatile. This type of reel has a fixed spool and the bail spins as your line is being retrieved, hence the name. Despite the fact that trolling reels are most popular for deep sea and offshore fishing, designed to handle big and strong game fish, they are a firm favourite of mine in the surf. In my native South Africa we call them “multipliers” and they are very popular amongst rock and surf anglers due to their robust built and ability to withstand tough conditions in the surf and on the rocks. When it comes to a bag or box to carry your stuff you have a wide choice amongst quite a range of products from a variety of manufacturers. In your search for the perfect bag or box pay close attention to the quality of the gear you survey. Take careful notice of things like hardy plastic, durable fabric, stitching strength as well as large, thick zips, hinges and clasps. Different bags and boxes have different organisational systems in order to cater for each and every angler’s preference. These may include different sized drawers, multi-purpose trays and ingenious side pockets. You need something that caters to your style of fishing, be it highly organised and lightweight to adaptive and prepared for all eventualities. With time, you’ll begin to work out what works for you. It goes without saying that you need to have an ample supply of hooks in your tackle box. Make sure that you possess a range of different sizes in order to cater for all eventualities. A very important aspect to keep in mind regarding non-stainless hooks is to make sure, once you are back home, that there are no moisture in their containers and to keep them dry at all times. The moment one hook accumulates rust it will spread like wildfire amongst the rest of them. When you engage in bait fishing on the bottom you will need some extra weight to take your bait down to the desired depth. When fishing the surf different weight sinkers in order to cast the line a considerable distance are essential. These can vary in weight from two ounces to about eight ounces, depending on your target species as well as your terminal tackle and bait size. Extra spools of leader line with different breaking strains are very important, because getting stuck in underwater structure or being smashed up by strong fish are hazards inherent to fishing. These can include braid, monofilament and/or fluorocarbon lines depending on the angler’s personal choice. The main purpose of swivels is to prevent tangling and twisting of fishing line that is an inevitable consequence of constantly casting and reeling in. Whenever you attach a lure to your line or separate your sinker line from your hook line, use a swivel as the connection. When you go fishing in the surf, the golden rule for me is: “The fresher, the better”. Whether it is filleted fish baits, prawns, squid or any other local bait species you may collect in the nearby vicinity, remember that most fish species (sharks excluded) are on the lookout for the real article and the fresher the bait the better your chances of inducing them to pick up your offering. It goes without saying that you need proper footwear if you intend to climb up and down rocky ledges in your pursuit for that elusive trophy. As far as I am concerned a good pair of sneakers with adequate grip on their soles will do the trick, but there are also special boots available for exactly this purpose. When fishing from the beach I am not too concerned about what you are wearing; quite a few anglers actually prefer to go barefoot! Then again if you are in possession of a pair of quality waders you can comfortably move in and out of the surf when casting or landing a fish without getting wet. This is especially convenient when either the weather or the ocean itself is not particularly warm. On a cool day getting constantly wet get eventually reduce your core temperature over a couple of hours to such a degree that makes fishing down right uncomfortable. Last but not least, get yourself a sturdy stainless steel knife for cutting lines and bait, cleaning fish and performing a myriad of other small tasks that are too numerous to mention. No fisherman can leave home without a trusty blade. For the novice angler I would suggest enquiring around to find out which are the most popular local angling spots to start off. Even though it may prove to be a bit crowded at times, the experience gained by spending time amongst more seasoned anglers will prove invaluable in times to come. This is the time to really come to grips with your tackle, especially your rod and reel. Practising your casting as well as honing your skills on different knots and baits will be your priorities during this initial period. Without trying to make sweeping generalisations, I find the bulk of anglers all over the world to be quite helpful and supportive for any novices. Therefore, don’t be shy to ask advice once you are there. There are a host of reasons why people go fishing; from just loving to be outdoors, trying to get away from whatever irks them, socialising with like-minded individuals to highly competitive individuals. Keep that in mind once you are amongst other anglers. Rule one is to respect each other’s space, especially on a crowded beach. Also, trying to cast as straight forward as possible in order to avoid entanglement with your next door neighbours. As mentioned some rock and surf spots may be quite hairy while others can be downright suicidal. Again, if you visit a fishing spot for the first time, carefully note what the seasoned anglers do and imitate their movements as closely as possible. Always carry the relevant time tables with you to make sure you know exactly what the tides are at a certain point in time in order to avoid being trapped by a rising tide in an isolated spot. Remember to never turn your back to the sea, especially on rocky outcrops where tidal of freak waves may occur. Many an angler have been washed from their fishing spot in places like these because they failed to pay proper attention to the deceptive movements of the ocean. If you consider the fact that you will spend a day outdoors next to the ocean then surely there are certain dangers involved. However, it is all relative, isn’t it? The biggest danger of fishing from the beach normally is getting sunburnt, so, be at least prepared for that! The inherent risks involved in this kind of fishing increase exponentially if you venture out onto precipitous rocky ledges and/or enter the ocean itself. For the vast majority of surf anglers content to park off on the beach without getting their feet wet, I would say the dangers are considerably less. Therefore, depending on your age, personality, adventurous spirit or just plain craziness, you have to decide how far you want to ratchet up the danger aspect of your fishing. How Long Can I Spend Surf Fishing in the Ocean Before I Get Tired? This is also a question that is directly related to each individual’s personal circumstances which include age, level of fitness, endurance etc. 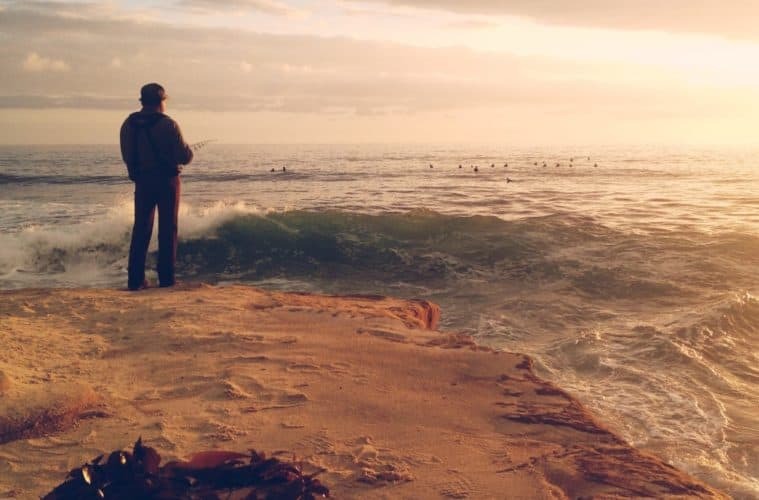 Like most other outdoor activities, rock and surf fishing means you are exposed to the elements 100% of the time and that aspect alone is markedly different from spending your day in an air conditioned and controlled environment. Normally a fishing day starts quite early and if you decide to spend most of the day at the seaside, you will be pretty knackered by the end of the day, notwithstanding the amount of physical activity you have been involved in. Could I Be Attacked by Sharks? The only time you will encounter sharks close up and personal in their natural environment will be when you leave dry land for a spot of reef fishing. Once being part of the ocean, you immediately become part of the marine food chain as well. However, the chances of you being investigated by sharks interested in medium size mammals for lunch are very slim indeed. The shark species you will come across will mostly be the ones hunting on shallow reefs for fish, crustaceans or sick and wounded marine species. Your biggest dangers would be waves, currents and slippery rocks. Having said that, bigger fish eating species like the tiger sand shark (ragged tooth shark in South Africa) can be quite annoying if they become interested in the fish at the end of your stringer. What Are the Best Conditions for Surf Fishing? For me the most important things to pay attention to are the time of the month, the tides and the weather. The tides are influenced by the moon phase which works in cycles of 28 days. I prefer to go fishing during full and new moon periods and on a rising or dropping tide. In my experience, during low tide and high tide, fishing activity tends to drop off. Most bone fish species seem to react significantly in relation to variations in weather patterns caused by atmospheric pressure. Once a low pressure system moves into a certain area the best time to go fishing is the day before the atmospheric pressure starts dropping. Once the barometer drops dramatically, most fish species that I hunt for will go off the bite. As long as the bad weather prevails and the air pressure remains relatively low, conditions for fishing are poor. However, if the front passes and the barometric pressure starts rising again, fishing conditions will improve rapidly. Should I Smoke a Joint Before Heading out Surf Fishing? This is really an issue to be decided by each one individually. I am definitely not a big fan of taking any mind altering substances to the water if I am interested in a day of serious fishing, but I know there are others who consider this aspect essential to their enjoyment of the sport. Each to his/her own, I say. Just beware of the dangers involved in the type of fishing you are about to engage in (especially when you intend fishing from rocks or piers) and consider the potential risks if you go fishing under the influence of some substance. Rock and surf fishing is truly one of my great passions in life. To pit yourself versus both the fish and the treaterous conditions is truly a unique delight. Take care when out there and bare in mind much of what I have said!